I Wonder... Would Anyone Really Want to Be a Child Again? A light amongst the darkness, and not to feel the pain. To sing without the worry of not knowing the song. I wonder. Would we really want to be a child again? Many who read this story had the rare distinction of growing up in an era and area of relative innocence as children. That is not to say that some grew up in an environment of poverty or discrimination. Generally speaking, however, life as a child was an equivalent of fun in the present and hope for a bright future. Had we been more aware of the harsh realities of much of the world, we would have realized that Dicken’s stories, such as Oliver Twist and A Christmas Carol, although fiction, were not fantasy. Would we really want to be a child again? Do we have even an inkling of the life of multitudes of children today? The impetus for this article was a CNN report about the plight of parents in drought-ridden Pakistan who have been selling their children in hopes of feeding the rest of their household. Some cases involve a family’s inability to repay a loan who are given the choice of selling their daughter or suffering other consequences. In one story, the family was offered several thousand dollars (How much is your child worth? ), but had been paid only $70 so far. An estimated annual average of 239,000 girls under the age of five in India die every year due to “invisible, routine, and continued discrimination” in nutrition, education, and health care, according to Lancet Global Health. The infant mortality rate in England and Wales has been steadily increasing. It is now more than 30% higher than the median rate of 15 EU countries. The root cause of the rise in the infant mortality rate, according to the Royal College of Pediatrics and Child Health, is increased poverty. Should the current trend continue, the college predicts that the child mortality rate will be 140% higher than the other 15 EU countries. In war-torn countries, starvation has become weaponized by militias and rebel groups. Save the Children estimates that half a million infant children could die within the next 12 months. Data from the United Nations supports this projection, also indicating that life-threatening hunger in war zones has increased by more than 20% over the past two years. The Lancet Infectious Diseases Journal recorded half a million children under the age of five continue to die each year from diarrheal diseases associated with unsafe water and sanitation combined with lack of access to medical care. The Johns Hopkins report cites high rates of obesity, injury, HIV infection, and teen pregnancy as the leading contributors to lower childhood life expectancy rates in the United States. The plight of children around the world – and here at home – is much worse than we imagine and much worse than any of us can address on our own. That is why so many faith-based NGOs focus so much attention on reaching children. Those organizations, whether independently or collectively, need our prayers and support in reaching the children who are “the least of these” in terms of being able to care for their own needs. Take time to pray and to consider what you can do to help a child have a childhood. 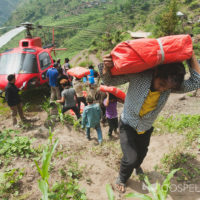 To read more news on the plight of helpless children around the world on Missions Box, go here. This entry was posted in Essays and tagged children, health, hunger, Poverty. Bookmark the permalink.